Photo courtesy of Jane Shotaku via Flickr. 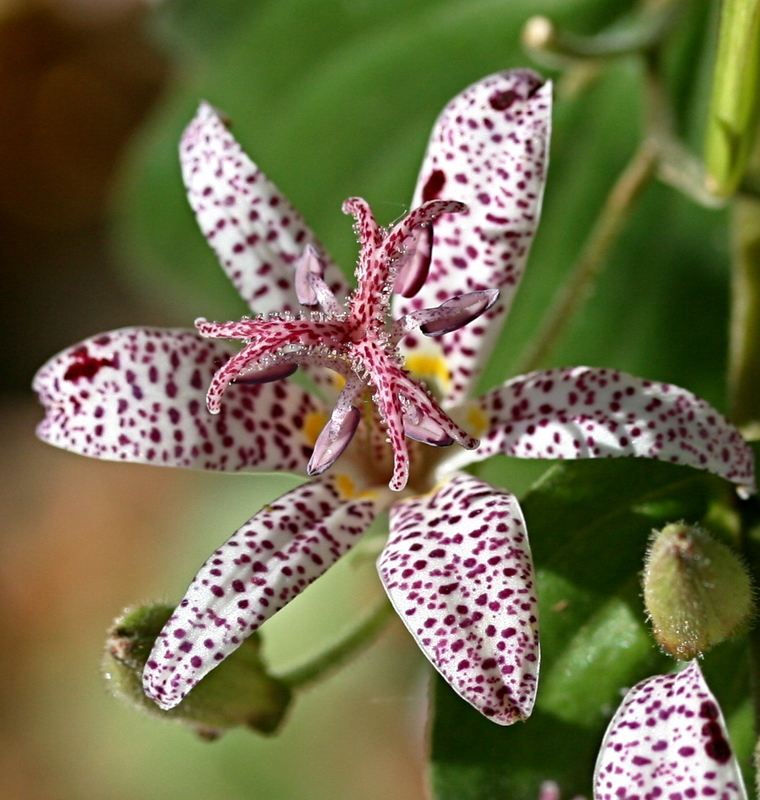 Like its namesake, toad lilies (Tricyrtis) favor damp, shady environs, but unlike the often unsightly amphibians, the plant—with its mottled, star-shaped flowers—is considered by many to be among the most beautiful in the world. It’s the beginning of November and my toad lilies refuse to die. They’re usually toast by now, but not this year. They keep blooming, fooling me into thinking it’s still September and that the coats can stay in the closet for a little longer. Other plants are managing a last gasp, a rose here, a hydrangea there. But the toad lilies are going and going as if winter will never come. Native to Asia, toad lilies are members of the Liliaceae family. These remarkably cold-tolerant perennials like moist, rich soil and partial shade. They have tiny, orchid-like flowers that bloom in clusters of 2 to 3 flowers each in the leaf axils all along the stem. Of the few species available in the U.S., some are predominantly white and others more purple, but all are delicately beautiful. I grow T. hirta, a variety known for its lavender-colored flowers with purple splotches. Their leaves are alternating bright green ovals up to six inches long, but there are cultivars available with gold or white variegated foliage. They generally grow to a height of about 3 feet and spread out a couple of feet or so, but mine only get a maximum of three hours of sun a day and stretch their necks longingly towards the rays, making them taller than most of their kind (an extra hour or so of daily sunshine might keep them shorter). Ridiculously easy to grow, toad lilies are hardy in Zones 4 through 8, have no pest or disease problems to speak of (the occasional slug, maybe) and deer don’t like them. When planting, whatever you do, don’t put them in a far corner. Toad lilies’ exquisite little flowers are just too small to be appreciated from a distance, so be sure to give yours a prominent spot where they won’t be missed. Although they are compact enough to be used to edge the front of a border, my babies are planted next to the front steps with pink colchicums and a lavender-flowered hosta, an accidental combination that glows in the shade and looks just as good after the hostas turn yellow when going dormant for winter. Of all the plants I’ve grown, it’s the only one that manages to look elegant and whimsical at the same time. With delicate cream and plum blooms sitting atop arching stems, they nod in the breeze like floral bobble heads. This entry was posted in Fall Gardening, Fall Gardens, Uncategorized and tagged fall flowers, fall gardening, Liliaceae, Organic Gardening, T. Hirta, Therese Ciesinski, toad lilies, toad lily, Tricyrtis, Tricyrtis Hirta. Bookmark the permalink. You compelled me to plant lilies in my garden! 🙂 When is the best time to plant them in the garden, and do you start them from seeds? The best time to plant them is in late spring or early summer, when the soil has warmed up a bit, and when there’s no more chance of frost (an established plant can take the cold, a newly planted one might not). That gives them time to settle in and produce flowers that fall. Toad lilies can be grown from seed, but you’ll wait a couple of years for them to get big enough to bloom. It’s easier to buy rooted plants at a garden center or from a mail order nursery. I often say, “Every bloom is a Masterpiece,” but this one is so lovely I just want to stare at it. Thanks for sharing this!